Leading Shia figures in the Muslim world have condemned the escalation of fighting in Najaf, in southern Iraq. And Iraq's most senior Shia cleric - Ayatollah Sistani, who is in London for medical treatment - has said he is pained by events in the holy city and has called for a ceasefire. One of the most influential Shia figures in the Middle East, the Lebanese cleric Mohammed Fadlallah, has criticised the American intervention in Najaf - and the Iraqi government for allowing it to happen. There has been a similar reaction from Shia leaders in the Middle East, Europe and as far away as southern California. Shia form 10-15% per cent of Muslims worldwide, and, for them, the Imam Ali shrine in the heart of Najaf is a place of veneration and pilgrimage. The drama in Najaf is being watched especially closely in the world's biggest and most influential Shia state, neighbouring Iran. 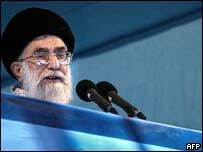 Newspapers in Tehran are giving prominent coverage to remarks on Wednesday by the country's supreme leader, Ayatollah Khamenei, attacking what he called America's dark crimes in Iraq. An article in the Tehran Times warns of what it calls an imminent "quasi-coup" in Iraq - naming as co-conspirators the Iraqi defence and interior ministers and the governor of Najaf. The aims of the plot, the article says, are to suppress the Iraqi Shia and cut the ties between the Iraqi and Iranian peoples. Current relations between the two countries are complicated. The social, religious and economic links between them are indeed close. But, in political terms, Iranian officials fear that an alliance is emerging between Iraq's interim Prime Minister Iyad Allawi and some of his ministers in Baghdad - and hawks in Washington - who share a common anti-Iranian agenda. "Across Najaf, the bombs continued to fall"